Six decades ago in Riverwest, a kindergarten boy stood at the edge of the Fratney Street School playground and watched a steam locomotive struggle past with a seemingly endless train of railroad cars. “Those engines would shake the school,” Jim Albrecht said. “The smoke and steam would be so thick that I’d miss the first three or four cars.” He added, “I would put my hands over my ears… the whistle was so loud, and they blew for every crossing.” When Jim began watching trains in the years following World War II, railroads had already been a part of Riverwest for nearly a century. In fact, the Beer Line Trail follows a section of one of the oldest railroad right-of-ways in the state. The Beer Line was not the state’s first railroad; that honor belongs to Byron Kilbourn’s Milwaukee & Waukesha, chartered in 1847. By the time the railroad was ready to lay track in 1849, its name (and its ambitions) had changed to Milwaukee & Mississippi. Kilbourn lost control of the M&M in early 1852 after some shady dealings came to light. Just three months later, according to John Gurda’s The Making of Milwaukee, Kilbourn was back in the railroad business, and the M&M had a competitor. Kilbourn’s La Crosse & Milwaukee started building northward from its terminus located between North Third Street and the Milwaukee River at Highland Avenue. The line followed the west bank of the Milwaukee River along Commerce Street. The railroad established a roundhouse and railroad yard at the southeast corner of North Avenue and Humboldt Boulevard, now a Jewel-Osco store. (A section of land south of the store will soon house the RiverCrest condominiums.) From there, the line ducked under North Avenue and climbed the river bluff to today’s Gordon Park, then turned northwest through the neighborhood to start toward La Crosse. The remnants of the “Roller Coaster” today. In the 1860s, Milwaukee banker Alexander Mitchell pieced together several different railroad companies into a unified system that would eventually become the Chicago, Milwaukee, St. Paul & Pacific — the Milwaukee Road. A north-south connector track was built in 1869 to link the former M&M line in the Menomonee Valley with the La Crosse & Milwaukee at North Milwaukee Junction near 32nd and Hampton. When it was completed, the former La Crosse & Milwaukee track became a 6.2-mile branch line that was officially called the Chestnut Street Line. 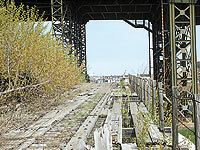 (Chestnut Street is the former name of Juneau Avenue, the location of the line’s original downtown yard.) But the railroad through Riverwest was destined to play a significant role in the new Milwaukee Road, generating more freight revenue per mile than any other part of the vast Milwaukee Road system. With three major breweries, Schlitz, Pabst, and Blatz, near the southern end, it’s not surprising the railroad soon acquired its “Beer Line” nickname. Beer was big business for the line. On some days, more than 250 railroad cars were loaded with beer and dispatched over the line. But there were many more customers for the railroad. Except for a few residential blocks at the northern end of Riverwest, the Beer Line was lined with heavy industry, including Nash (later American) Motors Seaman Body Plant on Capitol Drive west of Holton Street, which required 35 to 50 freight cars a day. Other major shippers included Continental Can, Schuster’s Department Store (which had a warehouse on Commerce Street), and more than 100 others. 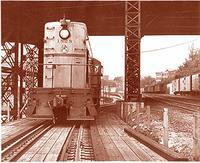 Steam locomotives were replaced by diesels in the 1950s, but train after train rolled through Riverwest. Jim Albrecht recalls counting as many as 100 cars in some trains — a moving steel wall nearly a mile long. In the 1940s and 1950s, Jim said, the railroad maintained a tiny “crossing shanty” at the corner of Locust and Humboldt. As the trains approached, an elderly man would emerge from the little shack and wave a sign to stop traffic. A heavy train climbing the river bluff from North Avenue would take 10 minutes to struggle through the intersection, posing a real problem for emergency vehicles that needed to get through. The Beer Line grew up with the brewing industry and it faded when brewing faded from the Milwaukee scene. Blatz closed in 1959. Schlitz, which once accounted for hundreds of carloads a day, began to unravel, finally closing in 1981. Pabst, never a major rail shipper, also gave up on rail service. In the mid-1970s, American Motors sharply scaled back production at its Capitol Drive facility. By the 1980s, the plant was shut down. By then, the Milwaukee Road itself was in a death spiral, soon broken up and sold off in pieces. The city and county have reclaimed some of those pieces in recent years. Under new owners, but starved of business, the Beer Line slowly retreated from downtown. Today, the railroad dead-ends at Richards Street, and the 130-year history of railroading in Riverwest has drawn to a close. Carl Swanson is an 11-year resident of Riverwest and senior editor of Model Railroader magazine. His book, Faces of Railroading, is reviewed in this issue of the Currents. Two sources he used in preparing this story were The Milwaukee Road in Milwaukee and The Milwaukee Road’s Beer Line. Both are available from the Milwaukee Road Historical Association (MRHA), online (http://www.mrha.com/catlist.cfm?passid=PB) and by mail: P.O. Box 307, Antioch, IL 60002-0307. Part of the Beerline trail is destined to become a bike and pedestrian trail. The River Revitalization Foundation has purchased the rail corridor from Gordon Park to Wright Street for that purpose, but recently negotiations to determine a route over the ReedCo property from Wright to North Avenue have stalled. The city has also purchased a four-block section of former railroad with a federal block grant earmarked for alternative transportation projects. The $750,000 CMAQ grant will allow the trail to extend northwest from Burleigh at Bremen to Keefe. Some of the funds will be used to remove the tracks, bring the land up to grade, and put in a paved trail. Other money will be used to provide street treatments at the places the trail crosses neighborhood streets. The City has no specific plans for the strip of land on either side of the trail other than keeping it green. It will not be city-maintained or mowed.